This afternoon I was riding Archery Trail in Tucker Valley, Chaguaramas when rounding a corner I cam upon this beauty. I think she measures in between 7 and 8 feet, I will check tomorrow, and it a Boa Constrictor, locally called Macajuel. I tried to hold her and all I managed was her tail as she was faster than I expected and was in no mood for a fondle or a casual tryst with me. I played with her taking mostly crappy photographs and she kept an eye on my ensuring I was not up to mischief. After a bit I decided that the literally 1000 mosquitoes had sucked enough blood out of me and I left her to continue hunting smaller meals than me. 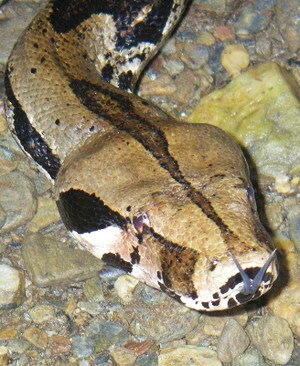 Boa is one of the heaviest snake. Thanks for sharing this awesome picture. Ohhh my! Im scared of those creatures. I will be supriced because I have a snake phobia. Probably If I would found something like this. I will run away. ummm I am so scared about this animals I do no like it, great picture !